Publisher: Watts & Co, 1931. Second impression of the stand-alone edition of “The Thinker’s Library”. Scarce! Condition: Hardcover, cloth. In very good condition. Mild edgewear. Interior is good also. Autobiography. 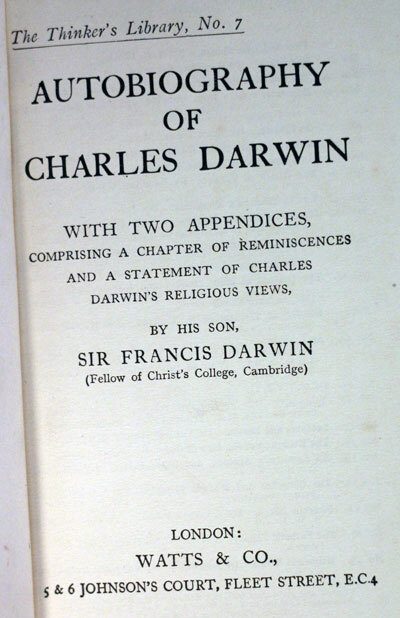 with Two Appendices comprising a Chapter of Reminiscences and a Statement of Charles Darwin’ s Religious Views by his son, Sir Francis Darwin. 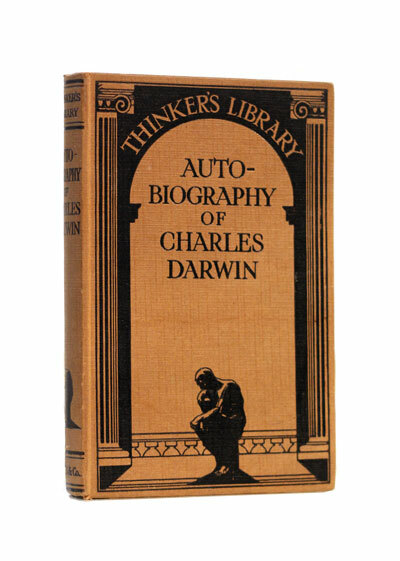 The work contains the first published version of Darwin’s autobiography, which was edited to avoid giving offence to his widow. This abridged edition is not to be considered merely as a short, and cheap version since it does contain matter not present in the original. The 1902 printing of it has a brief addition to the preface and a new portrait. Some recent editions of the autobiography also contain the autobiographical fragment which is proper to More letters.